The “signature injury” of the wars in Iraq and Afghanistan is Traumatic Brain Injury (TBI). According to the DOD, and by the very most conservative of estimates, nearly a quarter million U.S. military personnel have been diagnosed with TBI since 2001. Typically caused by close proximity to a “blast event” generated by an Improvised Explosive Device (IED), there are “no known” ways to “prevent it”—there is no body armor that can protect the brain from the successive waves of the blast—and there are no known cures for its array of effects, including “headaches, seizures, motor disorders, sleep disorders, dizziness, visual disturbances, ringing in the ears, mood changes, and cognitive memory and speech difficulties.” And, of course, it is no stretch to imagine that it is connected in some measure with the near epidemic of suicides among soldiers and veterans in recent times. What makes the injury especially tragic is that unlike war injuries that visually maim the body, TBI is an altogether invisible wound. A victim of TBI can look as ordinary and able as the average person you are likely to meet on any given day, the pain and disorientation that they experience a wholly internal private affair. And as with the horror of combat more generally, the injury exacerbates the effects of a kind of psychic aphasia that makes it impossible to express their feelings. At the Walter Reed National Military Medical Center in Bethesda, MD, victims of TBI are encouraged to create masks that put a face on their injuries and thus to give some voice to what they are experiencing. The photograph above is of Marine Cpl. Chris McNair (Ret. ), injured in Afghanistan in 2012. His mask is modeled after the “muzzle” that he came across in a photograph of Hannibal Lecter that he found on the internet. “That’s who I was,” he notes. “I had this muzzle on with all these wounds and I couldn’t tell anybody about them. I couldn’t express myself.” The analogy to Lecter is telling in two different senses. On the one hand, Lecter is a fictional character who displays refined culture and civility, and yet is capable of somewhat unpredictable outbursts of extreme violence making him incredibly dangerous … much like many of the victims of TBI. On the other hand, Lecter has been muzzled so as to protect us from his anti-social transgressions … much as we have created a public discourse that “muzzles” the wounded warrior as a pitiable survivor—”there but for the grace of God go I”—whose pain and injury we view from a distance but which we really don’t want to get too close to. 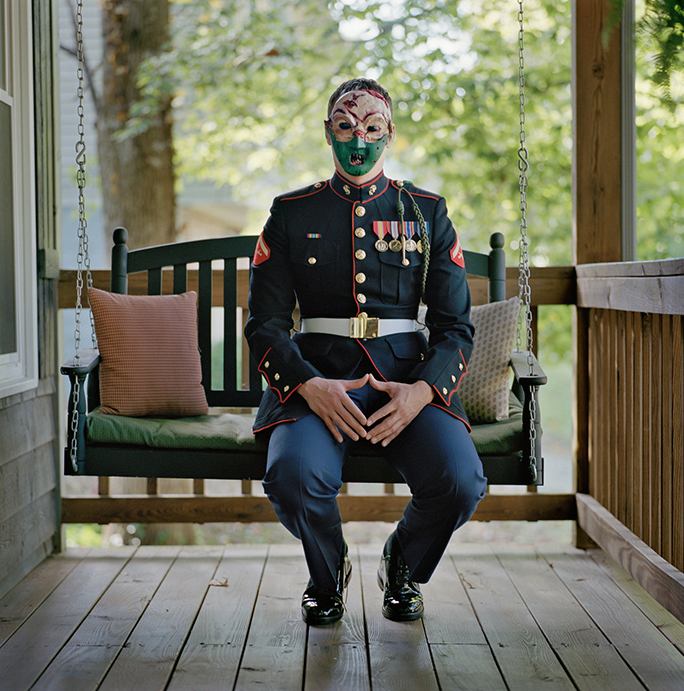 The photograph above is especially revealing in this last regard, for it underscores how isolated the wounded warrior is as a singular individual, marking his pain and his struggle as altogether alienated and private. Clothed impeccably in his dress blue uniform, his campaign medals on display, his brass buckle sparkling, he is the heroic warrior, but he sits alone on a swing on his front porch. He remains the soldier who sacrificed for his nation, but he must confront his pain and suffering by himself and in the most domestic of settings, wholly segregated from the public who sent him to war in the first place. While the mask purports to give voice to his inner pain, it also makes it possible for us to observe him (from a distance) without actually seeing him. And therein lies the problem, for however well intentioned art therapy projects of this sort are—and I have no doubt that they are well intentioned—they also underscore the public stigma that we attach to the victims of such injuries, as well as the implicit assumption that the “cure” to their injuries is private and individual — more their personal burden to bear than a shared public trauma. Until we can find ways to overcome both the stigma and that assumption it will be nearly impossible for such victims—or for us as a nation—to every truly be healed. And that may well be the biggest tragedy of the trauma of war.